For this month’s #LetsLunch, a virtual potluck on Twitter, the theme is green foods. For my contribution, I am making kale chips, my family’s latest snack craze. We love leafy greens in general, but it is amazing what a transformation kale undergoes when heated at low temperature in the oven– less like a good-for-you green vegetable, more like a potato chip. My kids can devour an entire head of kale prepared this way in five minutes flat. 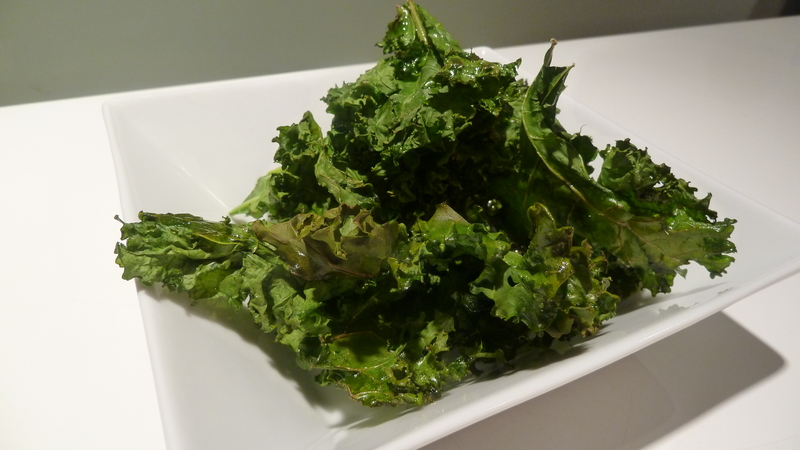 And unlike potato chips, kale retains its nutritional value when made into chips. Kale is getting a lot of attention for being the most nutrient dense food under the recently popularized ANDI scoring system. (Nutrient-dense foods are those foods that provide substantial amounts of vitamins and minerals and relatively few calories.) Kale is high in fiber, antioxidants, vitamin A and calcium, as well as B vitamins, vitamin C and potassium. It’s fat and sodium free, and the minuscule amounts of olive oil and salt in my kale chips recipe barely bumps those amounts. Back in December, humble kale was brought into the spotlight because of a lawsuit. A Vermont artist, Bo Muller-Moore, who for the past decade has produced T-shirts silk-screened with the slogan, “Eat More Kale,” applied for federal trademark protection of his slogan. That got the attention of the fast-food chain Chick-Fil-A, which accused Muller-Moore of infringing on its trademark, “Eat Mor Chickin’.” As the case continues, Muller-Moore has enjoyed increased business (I am planning to get shirts for my whole kale-loving, small-business supporting family) and has also embarked upon a Kickstarter project to produce a documentary about his legal battle. Legal intrigue and big vs. small business politics aside, I do encourage you to eat more kale, along with other green leafy vegetables. Your body will thank you for it. 1. 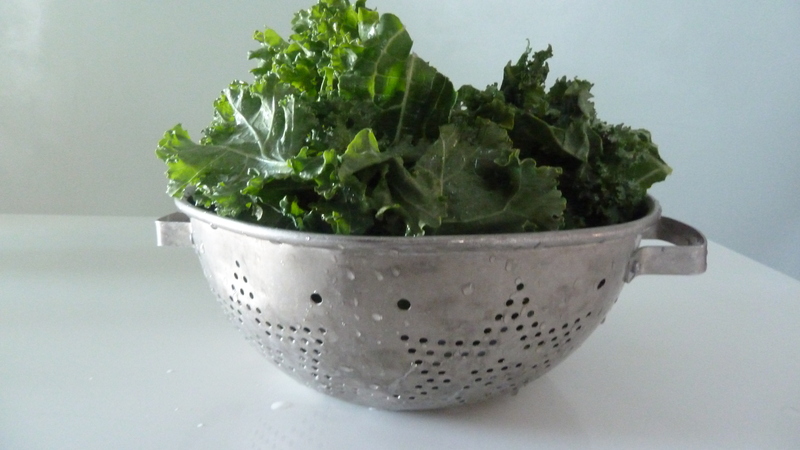 Wash whole kale leaves, then shake out or dry in a salad spinner, then place on a rack to dry thoroughly. Depending on your temperature and humidity conditions, this can take an hour or several hours. Alternatively, dry thoroughly with towels. 2. Preheat oven to 275 F.
3. Once kale leaves are completely dried, tear leaves off the fibrous central stem into bite-size (potato chip sized) pieces and place onto two baking sheets in a single layer with some space around each leaf. 4. Sprinkle on some salt and drizzle with a small amount of olive oil, about 1 Tbsp per baking sheet. Toss with tongs to evenly distribute salt and oil. 5. Place prepared kale leaves into the preheated oven, and bake for 20 minutes, turning over leaves halfway through baking. Do you have any other flavor ideas? Oooh, I have a pot of mustard greens…would those work, you think? Rashda, I’ve been wondering myself since I love mustard greens. Please try out and get back to me! I SO agree with you, and love Kale chips. Can’t wait to try some of your variations, love them. I love kale chips! I’ve never thought of adding any flavoring other than salt, though — could be a lot of fun; you have some great ideas, as usual. Felicia, I’m thinking your Indian popcorn flavoring would be great. I had no idea it was that easy. I might be able to get Kale into my kids this way! Thanks!!! It’s ridiculously easy, especially if you allow time for air drying. Hope your kids love them! Love Kale chips and so glad you warned people to dry them thoroughly. It’s same principle with stir frying, dry, dry, dry, otherwise they don’t crisp up. I can’t wait to try these, especially with your seasoning variations! Happy #letslunch date! Thanks for the reminder to try these out. I’ve been thinking maybe this is way to make veggies appealing to my picky kids. Just tell them they’re like green potato chips– try them on St Patrick’s Day, more likely to win them over then. Trust me– all kids love these, veggie lovers or not. We love kale, but I’ve never seen it here in France. Your recipe looks great. You’ve reminded me to ask my daughter to send me some seeds, along with the runner bean seeds she’s getting me. Thanks for returning my visit.